Fantasy Flight Games is proud to announce the upcoming release of Escape from Mount Gram, the second Adventure Pack in the Angmar Awakened cycle for The Lord of the Rings: The Card Game! Middle-earth is an ancient and storied place, and even such placid locations as the Shire share histories filled with drama, struggles, and warfare. Indeed, long before the Dark Lord ever cared about the Shire or the name of "Baggins," even long before the births of Frodo and Bilbo, Goblin invaders swept down from the mountains and made their way into the Northfarthing before they were turned back in the Battle of the Green Fields, where old Bullroarer Took struck the Goblin leader's head clean off his shoulders with a single blow from his wooden club. Now, in Escape from Mount Gram, the Goblins of Mount Gram are once again up to new evils, and when they capture a host of Rangers and heroes, it's up to you and your heroes to lead a daring and dramatic prison break! 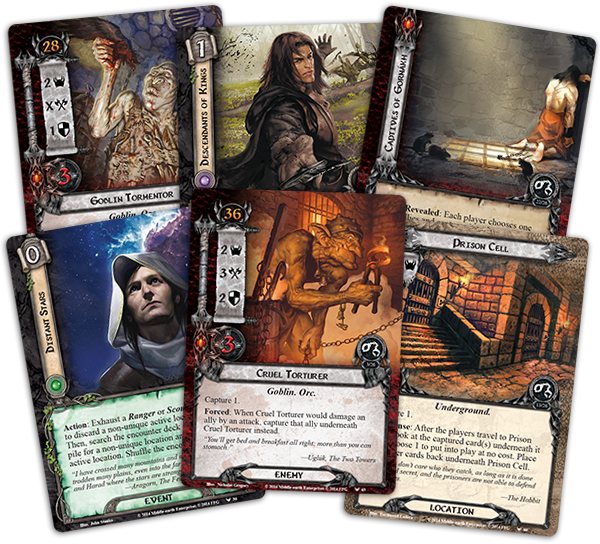 In addition to its new scenario, Escape from Mount Gram introduces a new hero for the Lore sphere and three copies each of nine different player cards. As suggested in the introduction to the Angmar Awakened cycle, these cards explore a variety of different themes, divided among the different spheres of influence. 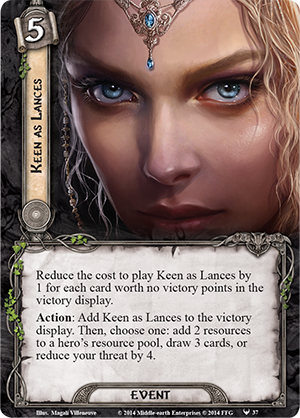 While Leadership players benefit from a pair of cards that encourage direct action against the Enemy, Tactics players gain a pair of Ent-focused cards, and Lore players gain two cards that support a new mechanic based around manipulating the encounter deck and the victory display: Leave No Trace (Escape from Mount Gram, 35) and Keen as Lances (Escape from Mount Gram, 37). If any of the game's four spheres is built for tricky interactions with the encounter deck, it has to be Lore. Since the Core Set, the Lore sphere has been home to most of the game's draw effects, making it arguably the best sphere for exploring card combinations, and it boasts twice as many cards that target the encounter deck as the next closest sphere, Spirit. These facts make Lore the perfect home for Leave No Trace, which could easily be mistaken as an ineffectual card. Its text reads: "Response: After a non-unique location is explored, add Leave No Trace to the victory display to add that location to the victory display." For even just one Lore resource, this doesn't initially appear to be a good bargain. Leave No Trace doesn't explore the location, nor even make progress on it. It doesn't cancel the location's effects or allow you to draw cards when the location is explored. It's not even free; you have to pay a resource to trigger it. And to top things off, it comes with the caveat, "Limit 3 copies of Leave No Trace in the victory display." This is only a concern in a multiplayer game, but even so, such explicit limitations are usually reserved for only the most powerful of cards. Black Arrow (On the Doorstep, 15), for example, reads, "Limit 1 per deck." However, as is now likely obvious, the truth is that Leave No Trace isn't limited to three copies in the victory display because of the impact it mades right when it's played, but because of the power it has to shape the course of the game as it moves toward its conclusion. 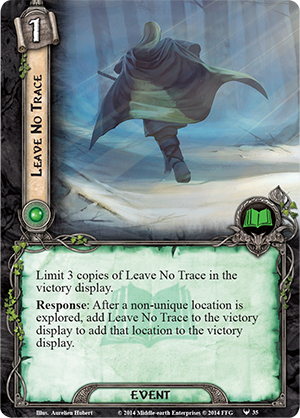 First of all, in a four-player game, or at any time that you think you might cycle through the encounter deck, Leave No Trace allows you to permanently remove from the encounter deck any locations with nasty "when revealed" effects, Doomed, or Surge. Likewise, it can remove locations with nasty ongoing effects that quickly add up whenever they start flooding into the staging area. Still, the card's true power becomes evident as it sets up the sorts of combinations that will become increasingly powerful throughout the Angmar Awakened cycle. For example, each time you play Leave No Trace, you reduce the cost of Keen as Lances by two – once for placing Leave No Trace into the victory display and once for placing the non-unique location into the victory display. Once you've played Leave No Trace twice, Keen as Lances costs only one resource; and if there are three copies of Leave No Trace in the victory display, you'll have at least three non-unique locations along with them and your Keen as Lances will be free. Also, if you're playing multiplayer, your teammates' copies of Keen as Lances will also be free. That means that you could each, for zero resources, draw three cards, reduce your threat by four, or add two resources to a single hero. Of course, we've already seen that other cards from the cycle can manipulate the victory display, such as Scout Ahead (The Wastes of Eriador, 9), and we can expect that other cards in the cycle will allow us to transfer our control over the victory display into a greater measure of control over the encounter deck. Accordingly, as we look forward to sending our heroes to aid the Rangers of the North, we can also look forward to some proper scouting. The more we know about the encounter deck and its dangers, the better prepared we'll be to defeat them. Forewarned is forearmed. North of the Shire and north of Bree, ancient evils long gone quiet are stirring once more. Head into the heart of a Goblin stronghold and execute a daring prison break in Escape from Mount Gram. 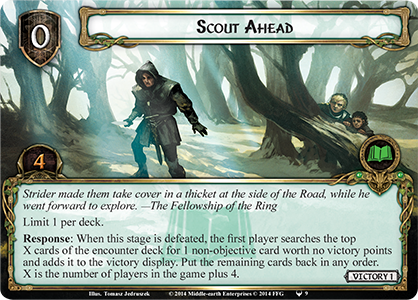 This second Adventure Pack in the Angmar Awakened cycle is scheduled for release early in the second quarter of 2015!